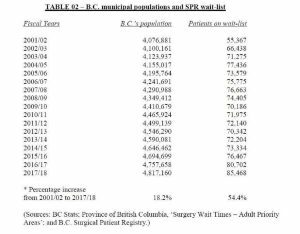 THE number of British Columbians on a wait-list for medically-necessary surgery at the end of the fiscal-year 2017/18 – a total of 85,468 patients – is greater than the populations of many sizeable B.C. cities, according to a new analysis by the B.C. Anesthesiologists’ Society (BCAS). 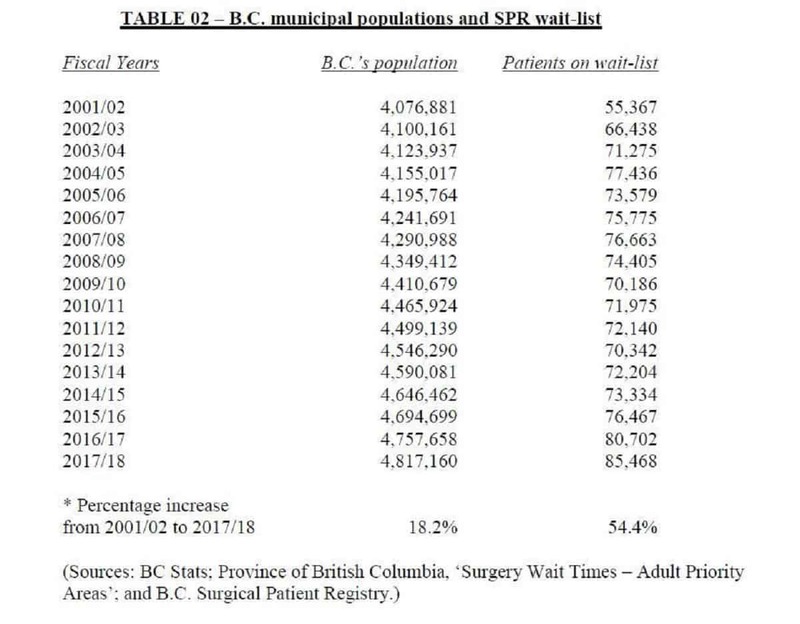 The BCAS on Monday at a news conference in Vancouver released a report entitled ‘Far Too Long, Far Too Many,’ the first in a series of discussion papers on B.C.’s increase in surgical wait-lists and wait-times. “We undertook considerable research to determine the size and extent of B.C.’s surgical wait-lists, as well as the length of time patients must endure before they receive treatment,” said Dr. Roland Orfaly, Chief Executive Officer of the BCAS. Orfaly emphasized that the purpose of the BCAS discussion paper was to illustrate not only the size of B.C.’s wait-lists and wait-times, but also to signal to all British Columbians that anesthesiologists want to work collaboratively with the provincial government, the regional health authorities and other health-care providers, to find solutions to the problem. “I think it was really telling that all three major political parties contesting the May 2017 general election mentioned the importance of surgical wait-times in their election platforms,” said Orfaly. Orfaly also noted that the title of the BCAS discussion paper was a quote offered last March by B.C. Premier John Horgan when he announced additional funding for knee- and hip-replacement surgeries. “We sincerely welcome the commitment by Premier Horgan to focus on the growth in the number of British Columbians waiting for medically-necessary surgery, as well as his dedication of new resources to address the issue,” said Orfaly.